Here is an opportunity for those who have not heard of the legendary Rani Laxmibai, the warrior queen of Jhansi, who gallantly battled against the British with her infant son tied to her back during the Indian revolution. With a tale spanning from 1828 to 1858, the film, “Manikarnika: The Queen of Jhansi” gives you a fair picture about her life and times. It tells us how Manikarnika born in Varanasi, marries Raja Gangadhar Rao Newalkar of Jhansi and is named Laxmibai in honour of the goddess Lakshmi and according to the traditions. The gloomy turn of events is perfunctorily handled and while the film captures the piece of history, the disclaimer at the very beginning of this period drama clearly lays the foundation for its faltering reproduction. Actress Kangana Ranaut who has helmed this film along with Krish Jagarlamudi, plays the eponymous role with all sincerity. Her craft-fuelled intoxication is both naive and endearing. She breathes life into the feisty Manikarnika, but, just like the eye lashes she flaunts in the film, there is something innately false in the story telling; the writing and direction. The scenes crafted like a tableau are slow paced with over dramatic gestures. The visuals with low angle shots, focus more on the grandeur of the palaces and poise of the actors and thus the film fails to hook you emotionally. Prasoon Joshi’s dialogues have a few gems strewn sporadically. The patriotic fervour it whips to such an extreme outcome in the end, that you inevitably start raising your eyebrows at the contrived narrative. 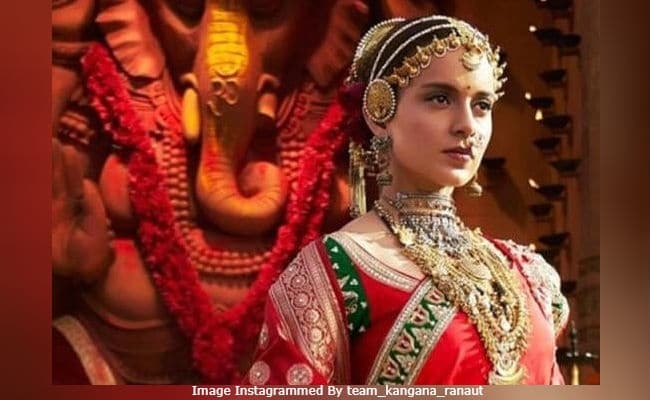 Supporting Kangana in her endeavour are; Kulbushan Karbanda as the chief advisor of Jhansi, Jishu Sengupta as Maharajah Gangadhar Rao, Atul Kulkarni as Manikarna’s ally Tatya Tope, Suresh Oberoi as Peshwa Baji Rao II, Mohammed Zeeshan Ayub as Raja Gangadhar Rao’s cousin Sadashiv, Ankita Lokhande and Prajakta Mali as Jhalkari Bai and Kashi Bai citizens of Jhansi. On the acting front, every actor appears sincere, but none stand out for their performance. Visually the film is a treat. The war scenes with astutely choreographed action sequences are imposing. Mounted on a magnificent scale of an epic with excellent production values, the elaborate production designs of the sets along with the costumes are impressive. They are painstakingly captured by Cinematographer Kiran Deohans’ lens. The VFX and the live action sequences are seamlessly layered by Film Editor Rameshwar S. Bhagat. Overall, this film is awe inspiring due to its grandeur but fails to touch the emotional chord in your heart. Next articleMr Majnu – Akhil as Casanova Excels , But..
© 2015 - 2019 Telugu 360. All right reserved.